the restaurant. The crew person hands the order to their "friend"
and asks them to take the order out to the blue Chevy. except myself, my employees, and the customer. would eventually deliver it to my customer. Operator has nothing to gain and a lot to lose. Or is there an upside here for McDonald's Operators? It is the wave of the future whether we like it or not. It will be a lot different in five years than it is today and probably be at least 5% of our sales. 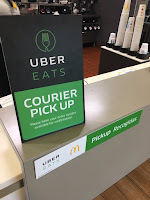 McDonald’s Corporation is greedy with rent, service fees & advertising on total sales not after Uber fee. Good time to be a shareholder. Experienced Operators will know, by the end of my first paragraph, that the reason these crew people's friends were hanging around this store was they were getting tons of free food from the employees. By my second week in the store, I'd seen enough and started making changes. This caused much-needed turnover but there were plenty of kids who wanted those jobs. By the end of my first month sales had turn positive and my food cost was down. At the end of my third month the FSM called to ask how we had gotten such a nice jump start, I said, "We're making people pay for the food". Bummer to lose money on 5% of your sales! Wouldn't an Operator work to reduce the amount of delivery business? As for the future, I'm wondering if the market for delivery is wide but very thin. Especially now that so many chains are jumping into the business. Quality is always going to be an issue. Last summer I visited family in the Midwest. There's a fried chicken restaurant in their town that's outstanding and we dine there every time we're together. A small start-up delivery service had just launched so we ordered mass quantities of chicken from the delivery company's website. It was just OK. The delivery worked well but the chicken was not as hot and not as crisp. Actaully no better than KFC. We'll be going back to eat at the restaurant this year. These sales are UNPROFITABLE for the Operator. And they canabalize in store sales,further eroding margins. And who likes COLD FRIES ??????????????? ?